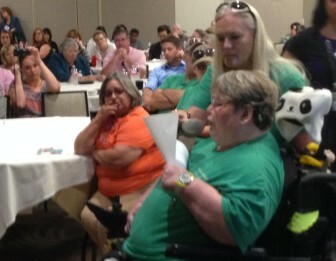 Oklahomans with disabilities and professionals who care for them attended the Oklahoma Health Authority Board meeting. Sue Shelton of Pryor got up early Wednesday to take part in a three-hour caravan headed for Oklahoma City. 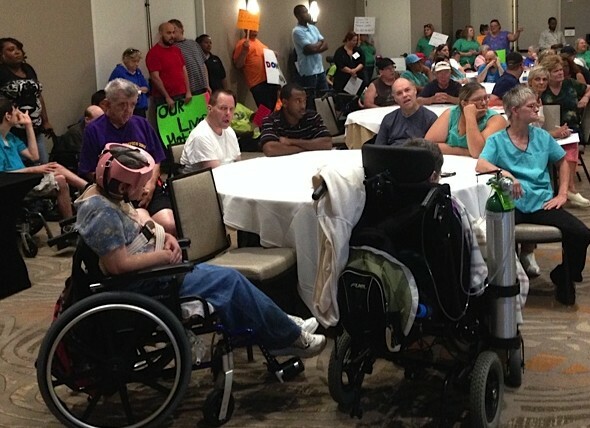 She had something important to say to the board of the Oklahoma Health Care Authority. “I am scared,” she told the eight grim-faced board members. If the board endorsed provider rate cuts already approved by the Oklahoma Department of Human Services, she said, the health care workers who help her live independently might leave their jobs. Sue Shelton of Pryor addresses the Oklahoma Health Care Authority. Leanne Hill, senior support coordinator for Central State Community Services in Pryor, said most of the workers who help care for Shelton and other clients earn $8.35 per hour. Their supervisors earn $10.35, she said. Staff turnover is high. The OHCA board went ahead and approved the 3.5 percent rate cut for developmental disabilities service providers. The action will reduce spending on the programs by $11 million. That includes about $7 million in federal funds and $4 million in state funds. And so it goes, as state agencies absorb the budget cuts caused by reduced legislative appropriations and reduced funding from other sources. In addition to the $11 million reduction in funding for developmentally disabled providers, the Health Care Authority also approved a $5 million cut for health care providers who serve aged, blind and disabled Oklahomans. That includes about $2 million in federal funds and $2 million in state funds. The provider cuts were a last resort for the Department of Human Services, said Communications and Community Relations Director Sheree Powell. DHS had to cut its budget by $45 million this year, Powell said. The Legislature reduced appropriated funds by $12 million, and the department experienced a $33 million reduction in other funding. The department absorbed most of the reduction by reducing administrative costs, Powell said. Among other things, it cut its staff by 87 people. If DHS did not reduce its provider rates, it would need to eliminate many more jobs, she said. OHCA’s endorsement of the rate cuts was the last step in their implementation. The board voted unanimously to approve them. Board Chairman Ed McFall of Porum said he regretted the action, but saw no alternative. McFall told the scores of people attending Wednesday’s session that the problem did not lie within DHS or OHCA.